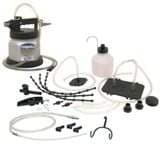 Brake and Clutch Bleeding Equipment Mityvac offers several great options to meet your unique hydraulic brake and clutch bleeding requirements. Our manual pressure bleeder and selection of manual and compressed air-operated vacuum bleeders provide a clean, economic one-person method of removing old fluid and trapped air from hydraulic systems. Each is designed and manufactured for exceptional performance, and includes a selection of convenient, time-saving accessories.